Senate President Justin Alfond says that’s an obstacle for those who need aid, but the LePage administration says most recipients will have easy access. It would take an 80-minute bus ride with 72 stops to make a round trip from downtown Portland to new Department of Health and Human Services offices proposed in South Portland, say lawmakers and Portland officials who will join advocates for the poor Tuesday to protest the state’s selection of the site. City leaders and Democratic lawmakers say the location near the Portland International Jetport would make it harder for recipients of state assistance to get benefits in person. The LePage administration, meanwhile, says the state never intended to move the offices out of Portland, but doing so may better serve more than 61,000 people in Cumberland County who receive state assistance. In October, about one-third of those public assistance recipients were from Portland, according to data published by the DHHS. The data does not show how many walk or use public transportation to reach the current office on Marginal Way, which is within walking distance of most neighborhoods on Portland’s peninsula. Since news of the plan broke late last month, city leaders and other developers have criticized the state’s selection of ELC Management Inc. to build and lease an 80,000-square-foot building for DHHS and Department of Labor offices next to the Hilton Garden Inn at the airport. The 20-year lease would be worth about $43 million, pending a final agreement. 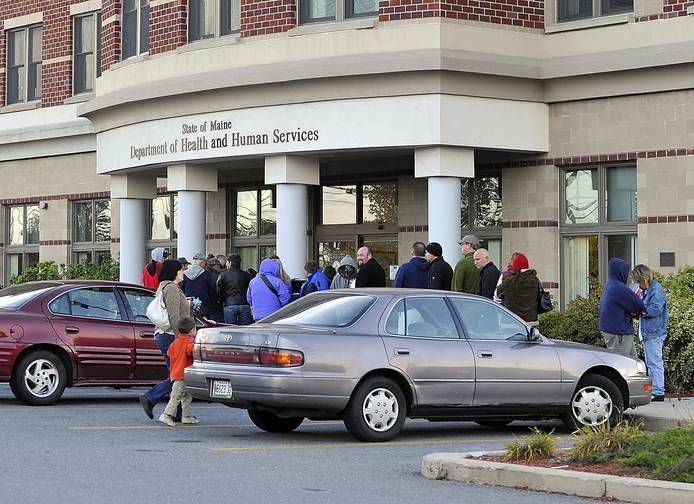 People apply at DHHS offices for aid such as food stamps and Temporary Assistance for Needy Families, and get referrals for mental health and other services. Jennifer Smith, a spokeswoman for the state Department of Financial and Administrative Services, which oversaw the selection process, said Monday that Fore River Co., the landlord for the current location, had asked the state to pay more to sign a new lease and stay there after its current lease expires in 2015. She said the state entered the lease negotiations hoping to pay less than it does now, and negotiated with Fore River Co. for more than a year before putting the lease out for bids. “We don’t know exactly how much more (Fore River) wanted us to pay, but we knew it was more than the state could reasonably and responsibly pay,” said Smith. She said the state would likely save $14 million over 20 years with the new lease while consolidating DHHS services with Department of Labor offices. Smith said state officials are still negotiating lease terms with ELC Management Inc., which has an option to buy the undeveloped property near the airport, and hope to pay less than the approximately $30 per square foot that the state pays on Marginal Way. Alfond and other lawmakers, along with Portland Mayor Michael Brennan and representatives of the Preble Street Resource Center, plan a news conference on the issue at 10:30 a.m. Tuesday at the Avesta Housing center on Cumberland Avenue. Earlier this year, the state Bureau of General Services requested proposals to house the DHHS offices, as well as the Department of Labor offices that are now on Lancaster Street in Portland’s Bayside neighborhood. It got proposals for four sites – two in downtown Portland, one near the Long Creek Youth Development Center in South Portland, and the site near the airport. The state used a scoring system that considered location, cost and other factors. State records show that the South Portland site received high scores because it is on a Metro bus route. According to maps of the route, riders starting from Congress Street in downtown Portland would ride 80 minutes round trip and stop 72 times to reach the new location. DHHS offices have been on Marginal Way for the past 20 years and have been in Portland even longer. The state rejected proposals for two downtown locations. Smith said that although critics are focusing on the fact that the chosen site isn’t downtown, most recipients would have easy access to the airport location, which is close to the Maine Turnpike. ELC Management is owned by Eric Cianchette. He and his family have close ties to the LePage administration and a history of prolific financial support for the Republican Party, a fact that has sharpened criticism of the selection. H. Sawin Millett Jr., commissioner of the Department of Administrative and Financial Services, said the department’s Bureau of General Services, which selected the winning bidder, followed procedures set out by the Legislature to ensure fairness and transparency.